Last night, Pearl Jam performed at Chicago’s Wrigley Field and during their set, former Chicago Bulls player Dennis Rodman made an appearance onstage to discuss his time in North Korea, as well as his love for Chicago and its people. Rodman then left the stage, handing the instrument to Eddie Vedder, who quipped: “Dennis, just put that day off as long as possible. Do me a favor, alright?” Vedder then performed the acoustic version of the Pearl Jam song “Sleeping by Myself,” which was originally recorded by Vedder on ukulele for his Into The Wild original soundtrack. Rodman has a history of appearing onstage with Pearl Jam. 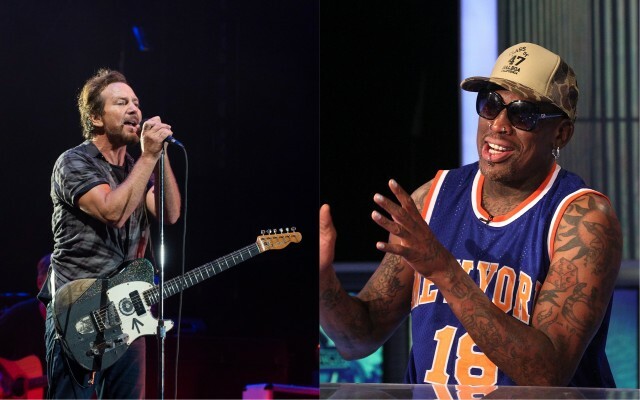 The former Chicago Bulls player carried Vedder onstage at Wrigley Field in 2016 and in 2007, Rodman put Vedder on his shoulders while the musician sang a cover of “Rockin’ in the Free World.” Earlier this year, Rodman shouted out Vedder during an interview with CNN about his friendship with North Korean dictator Kim Jong Un. Watch Rodman’s latest appearance with Vedder below.